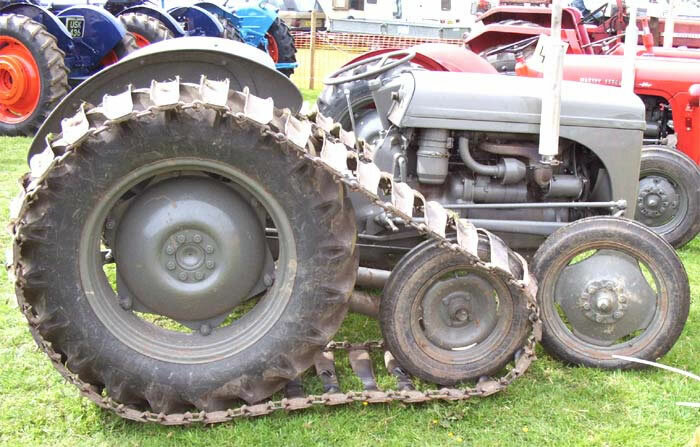 Ferguson TEF 20 Diesel Half-Track Tractor 1955. The Ferguson TE range of tractors were a boon to suppliers and designers of add-on components. A comprehensive range of Ferguson branded implements were available, but because Harry Ferguson lacked sufficient manufacturing resources production was contracted out to other makers. The Rubery Owen factory at Darleston produced ploughs, tipping trailers were made by John Sankey & Sons at Wellington, and at Wolverhampton Midland Industries constructed cultivators. The standard Ferguson top link could only be adjusted with the use of spanners, Tamkin Brothers of Maldon Essex offered an easily adjustable replacement which did not require the driver to leave his seat for easy adjustment.